Madrid has more wine bars per head than any other city in Europe, quite possibly the world. You literally can't go more than a few metres before finding another. Photography courtesy La Vinoteca Barbechera, stop madrid, cerveceria alemana and Vinoteca Vides. 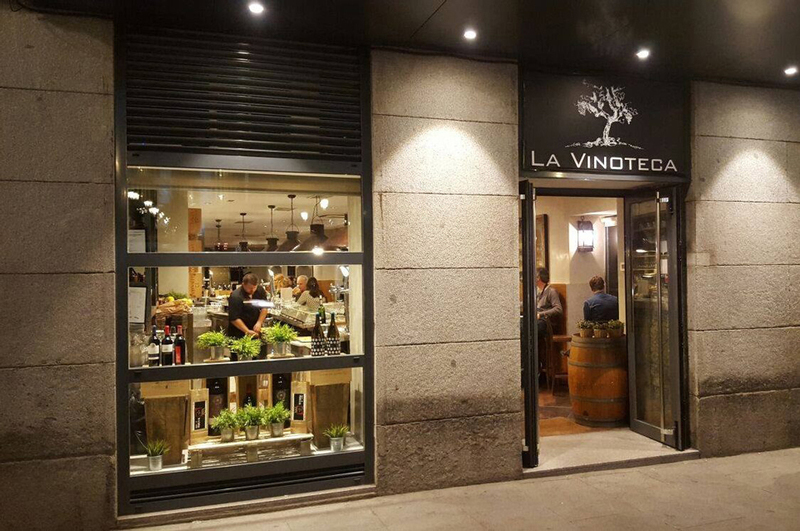 This popular and modern wine bar is situated at the bottom of Santa Ana Plaza in the Barrio de las Letras district. Plenty of space inside allows customers to sit around the glass-topped, upturned barrels and relax with some tapas and a cold beer. In past years, they took a more international approach (if you really wanted to go to Spain and drink Aussie wines, this was your place), but lately they have concentrated on the best homegrown wines. I recommend the youthful Spanish whites – they are a revelation. Also at Santa Ana Plaza is La Alemana, offering a serviceable selection of wines, but locals and visitors alike are drawn here for the extensive selection of beers – there are days in Madrid when chilled cerveza will seem more appealing than a glass of La Tâche – and because it was a regular haunt of Ernest Hemingway. He even recommended the place in an article he wrote for Life Magazine. Actor and singer Ava Gardner was another regular. 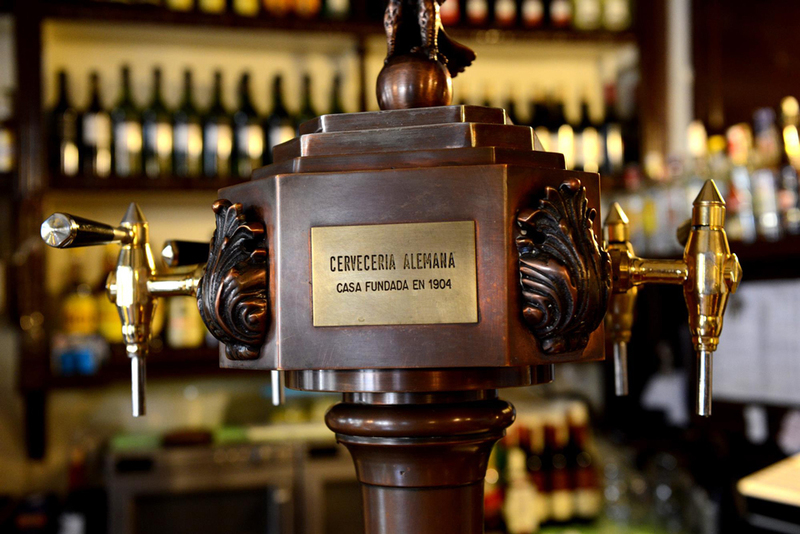 Since its opening in 1904, La Alemana has gone through numerous incarnations – a bullfighting era, Hemingway and friends, hippies in the ’60s/’70s and today, a very popular beer hall. 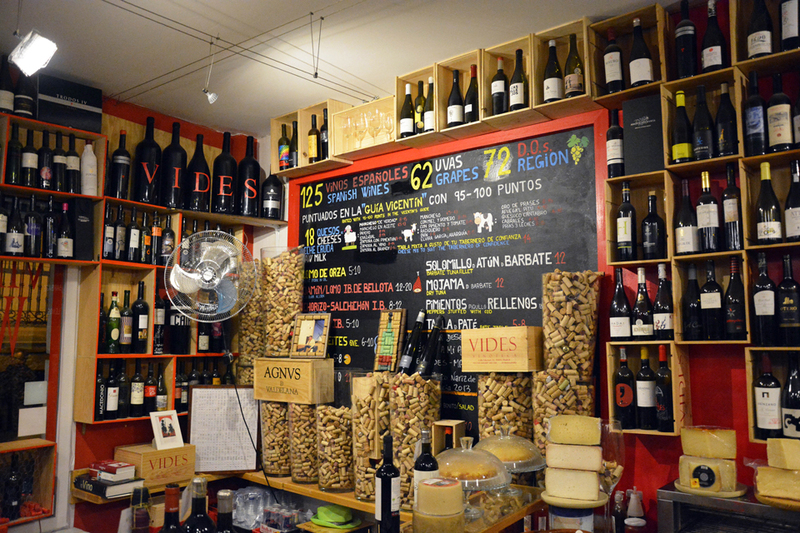 Another very popular wine bar in Barrio de las Letras, founded in 1931, includes a wine and cheese store, and tables front and back to enjoy selections of both. Casa Gonzalez offers more than 200 Spanish wines, around four dozen by the glass each day (many of the them just €2.50), and an array of cheeses, delicatessen items and game. 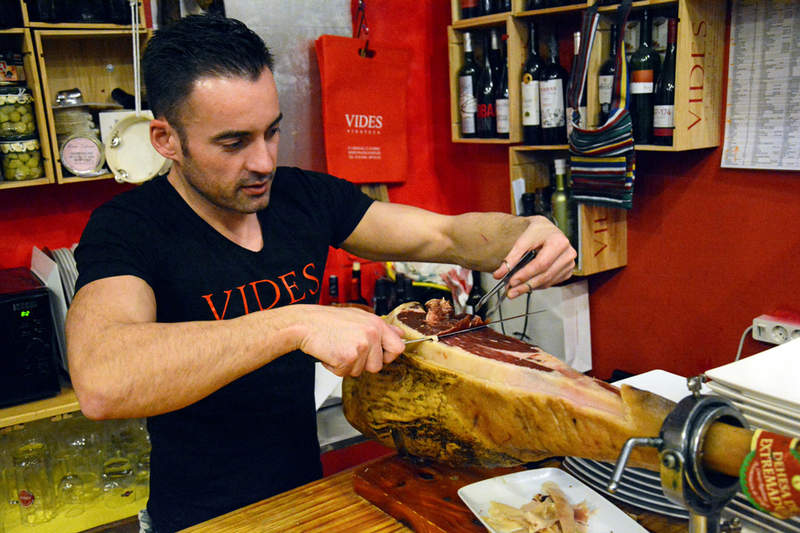 It was to offer top-notch meats and cheeses that founder Vicente González first decided to open the place, though there were problems during the Spanish Civil War – he was imprisoned for much of its duration. Great value Priorat is just one of the highlights, but all regions are covered. A very welcoming establishment run by brothers – chef Pedro and sommelier Luis – offering fabulous food and an amazing array of wines. There is a dining room, but it is more fun to eat at the bar with the locals. They focus on seasonal produce and ‘comfort food’. The wine list includes hundreds of Spanish wines, but the highlight must be the opportunity to taste old Rioja, dating back to before the Civil War. There is a decent list of cerveza and the service is exceptional. 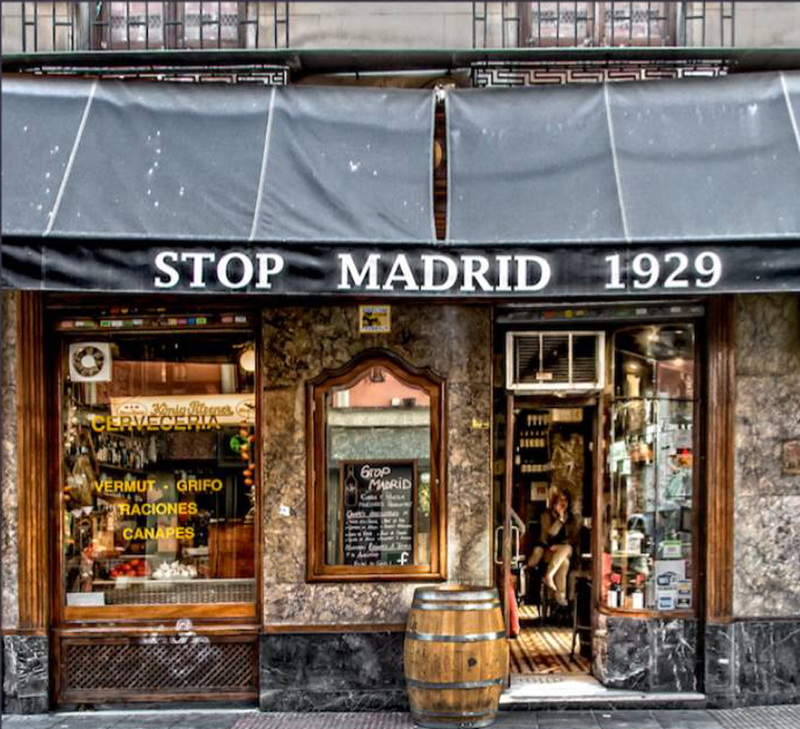 Stop Madrid prides itself on being one of the twenty oldest taverns in Madrid, dating back to King Alfonso XIII’s time. Since the 1980s, the focus has been on quality wine. An oasis to escape the throngs of visitors, there are usually more than 40 Spanish wines available for tasting, from all regions though most notably Ribera del Duero. Wine barrel tables, chalkboard menus, and an extensive range of Iberico Jamon – if that doesn’t get you through the doors, hard to imagine what will. I spent some time searching for this much-praised and quintessentially Spanish bodega, which opened in 1920. Eventually, I gave up and went into the nearest wine bar for a drink to regroup. Before long, I was enjoying myself so much – great value wines, terrific tapas, and delightful staff – that I thought I’d ditch Rosell and include this place in my top 10. Turns out, I was in Rosell. Like many Spanish bars, vermouth on tap is very much flavour of the month. 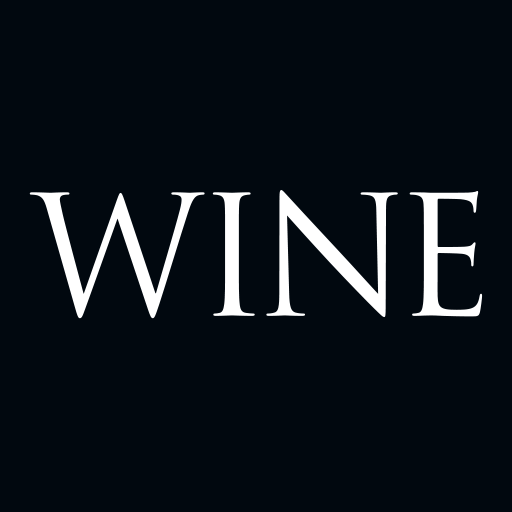 They have over 200 wine selections on the wine list and the perfect dish for everyone. If any place in Madrid should convince you to look beyond recommendations and take a chance, this is it. I’d researched every suggestion and this place was never mentioned, yet this young, pulsing wine bar with a focus on the Basque region should be on every must-visit list. Wonderfully helpful staff, who took me through different styles of txakoli, which offers a slight sparkle, bone-dry finish, diminished alcohol but vibrant acidity. Their choice to match it? Anchovies with olive oil and spicy Basque peppers, with plenty of crusty fresh bread to mop it all up. This very different wine bar is a little off the usual tourist track, in the trendy Chueca neighbourhood. Owner and grapegrower, Vicente Herrero, offers more than 40 wines by the glass with another 120 by the bottle. The selections cover more than 70 specific Spanish regions and nearly as many varieties, though Herrero is a strong supporter of wines from his native Castilla–La Mancha district. This is the place to dive into the world of unknown varieties, rarely encountered regions, and underrated Spanish wines. Restaurante Amazonico, a haven for jazz aficionados, presents a wine list which has to be one of the most exciting in Spain. The food is superb, modern fusion, and the wines thrilling. We tried a fabulous Spanish pinot noir (yes, there is such a thing), Alta Pavina Citius, from high-altitude vineyards near Valladolid. There are 4,500 wines on the list, from around the globe, though Spain is the focus (Grange, if you wish). If you want to treat yourself, this is the place. This hole-in-the-wall bar, a small, dusty room down a narrow back alley off Santa Ana Plaza was founded in 1922, and once word-of-mouth stuff only. Inside, an old wooden bar, hundreds of dusty old sherry bottles on the shelves and a collection of ancient barrels. The walls are stained dirt brown through grime, smoke and time, with a few posters celebrating sherry festivals from decades earlier. The only thing you can order is sherry – fino, manzanilla, palo cortado, amontillado and oloroso – all refilled from barrels which are selected in Jerez by the owner. They range from €1.90 to €2.20 a glass, making this brilliant value. It’s how sherry was meant to be drunk. Your tab is written in chalk on the bar and at the end of the evening, the cash is deposited into an ancient wooden register, worked by an old-fashioned lever. It just might be the best bar in the world!